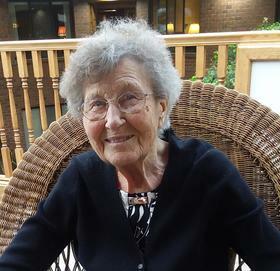 Winifred “Winna” Sal, age 92 of Hamilton passed away Thursday, February 7, 2019 at Resthaven Care Center. Winna worked for several years in the lunch program at Hamilton High School and was a charter member of Haven Reformed Church. Winna’s favorite time, was when she was with her family. She was preceded in death by her husband Larry in 2016. Ryan and Tricia Sal of Holland, Dan and Cetta Sal of Traverse City, and Laura and Dan Hron of Virginia Beach, VA; 8 great grandchildren, Camden, Aidan, Connor, Wyatt, Nathan, Rosie, Ramsey, and Summit; sister, Norma and Warren Wierda of Zeeland; nephews, nieces, and cousins. Funeral services will be 2 pm Saturday (February 9) at Haven Reformed Church, 4691 Oak Street, with the Rev. Ronald Ver Wys officiating. Burial will be in Riverside Cemetery, Hamilton. Visitation will be 1-1:45 pm prior to the service at the church. Memorial contributions may be made to Leadership Resources International or Haven Reformed Church Memorial Fund. The family would like to thank the staff of Royal Atrium and Resthaven Care Center for the special care given to Winna.